I love getting up early in the morning almost like a child rising early on Christmas morning. Walking quietly down the stairs trying not to trip over our dog, Lady, who insists on sleeping at the top, I start turning on lamps and the Christmas lights. Taking my coffee, devotional, and diary to my favorite seat I plop myself down. I need this quiet time with the Lord each morning before I start the day. This is the view from where I sit with legs curled up under me, knowing full well I won't be able to walk properly once I untangle them. Sitting in the dark, the lights from the Christmas tree reflect in the black t.v. screen and the white lights of the flocked tree dance across the varnished wood floors. Even the idea of taking down all this "Joy" is a little disheartening. Rick prefers I leave it up until his birthday is over and that's always been just fine with me. Do you rush to take down your Christmas decorations or like a child, want to hang on to the magic just a little longer? Magical! I love the look too! Just not so early in the morning! 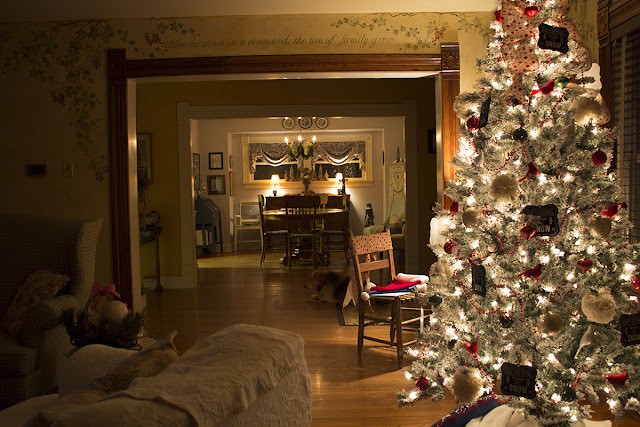 I love to leave my tree up too, I'm afraid I cannot get up before it's day light, usually if I get up and it's dark, ... I'm on my way out someplace.